The VanCleave Hotel was located on the southeast corner of Robinson and Washington Avenues south of the L&N Railroad Station. It occupied Lot 3 of Block 24 of the Culmseig Map of Ocean Springs (1854). The former Hotel VanCleave Hotel in 1915, when it was called The Commercial Hotel. The VanCleave Hotel was a two story wood frame structure with an area under roof of 5450 square feet which included a 9-foot wide gallery on the front (west) and depot side (north). The living area was approximately 4300 square feet. Although initially called the VanCleave (1880), this hotel had the distinction of being the hotel with the most name changes through its lifetime. At various times, it was known as the: Meyer Hotel (1891), Gillum Hotel-City Hotel (1893), Frye Hotel (1895), City Hotel (1898), The Inn Hotel (1897), Iberville Hotel (1905), Commercial Hotel (1906-1915), Commercial House (1915), and Commercial Hotel (1915-1920). Its builder, Robert Adrian VanCleave (1840-1908), was a founding father of the Town of Ocean Springs. He arrived at Ocean Springs in 1867 from Yazoo County, Mississippi with his new bride, Elizabeth R. Sheppard (1842-1912). She was the step-daughter of entrepreneur George A. Cox (1812-1887). With Mr. Cox who came to Ocean Springs in the early 1850s, VanCleave established a store on Bluff Creek to trade with the charcoal burners in that area. This commercial venture led to the development of the present day village of Vancleave. At Ocean Springs, VanCleave owned and operated the R.A. VanCleave & Son mercantile store just south of the VanCleave Hotel on Washington Avenue. Their slogan was "Best Quality and Honest Quantity". The VanCleave home was adjacent to the store on the northeast corner of Desoto and Washington. Seven children were born to the VanCleaves. They were: Fannie VanCleave Covington (1866-1893), George A. VanCleave, Robert A. VanCleave Jr. (1869-1897), William S. VanCleave (1871-1938), Richard S. VanCleave (b. 1875), Sarah Reid Westbrook (1876-1934), and Junius P. VanCleave (1879-1945+). Among the many accomplishments earned during an active life time, VanCleave was appointed the first provisional Mayor of Ocean Springs in 1892, served as Postmaster at Ocean Springs from 1872 to 1882, and was appointed from 1885-1889 as Special Agent of the U.S. Land Office to protect public timberlands. VanCleave's new hotel on the depot grounds is going steadily forward to a speedy completion and gives employment to a number of workmen. He seems to believe in the right way of doing things - that is employing home folks when he has work to be done. (The Pascagoula Democrat-Star, January 16, 1880, p. 3). This entirely new and comfortable hotel opened on the 1st of May, 1880, and will remain open all the year round for the accommodation of regular and transient boarders. This hotel being entirely new and elegantly fitted up, and with large, well ventilated rooms lighted by gas, boarders will find every comfort desired. Special arrangements made for family. Rates moderate. On September 9, 1882, probably the most memorable event to take place at the hotel and possibly in Ocean Springs occurred. This special occasion was the military review by Jefferson Davis (1808-1889), former President of the Confederate States of America, of the Reichard Battalion and German Guards of New Orleans under the command of Major Maximillian Hermann. The troops were accompanied to Ocean Springs by Wolf's band. The train, which carried the military personnel, stopped at Beauvoir for Davis and his daughter with the band playing the "Bonnie Blue Flag". When they arrived at Ocean Springs, the uniformed Ocean Springs Fire Company greeted them in a heavy rain at the depot. The honored troops marched to the splendidly decorated VanCleave Hotel where they were welcomed by R.A. VanCleave, President of the Ocean Springs Fire Company. After a review by Jefferson Davis, a reception with champagne punch sponsored by W.B. Schmidt (1823-1900) was held in the parlor of the hotel. The festivities of the day were concluded with a grand military ball at Schmidt's Ocean Springs Hotel. During Mrs. Meyer's ownership (1891-1905), it appears she leased the premises to Adele H. Gillum, Mrs. John Shanahan, and Mrs. Frederick Frye. While Mrs. Gillum held the lease, a category three hurricane struck Ocean Springs on October 1, 1893. This tempest severely damaged the City Hotel as it was then named. During November 1893, the structure was repainted. The Pascagoula Democrat-Star of January 12, 1894 reported that, "Mrs. Adele H. Gillum will shortly give up the City Hotel and move to New Orleans". She and her daughter, Effie, moved to No. 153 Race Street in New Orleans later that month. Mrs. John Shanahan leased the hotel, which was a favorite for commercial travelers in the spring of 1894. She opened for business on April 1, 1894.
town. Special attention to commercial men and tourist. and Calhoun. Her daughter, Bridget Shanahan White (1860-1943), assisted her in operating the Meyer Hotel. Here (Ocean Springs) Mrs. Frye is located centrally, and, as her reputation for setting a good table is unsurpassed, she has a large trade among travelling men. She also makes a specialty of serving dinners to excursionist. Frye's Hotel is a solidly built structure with wide verandas and is well fitted for the reception of both summer and winter guests, the rooms being fitted with large open fireplaces. This house will remain open the year round and it is the intention of the proprietress to thoroughly remodel and refurnish the place the coming fall. Dr. Oscar L. Bailey (1870-1938) bought the lodge known as The Inn with the adjoining lots in November 1905, for $3000 from Emma Meyer. (JXCO, Ms. Land deed Bk. 30, p. 301) Dr. Bailey had come to Ocean Springs circa 1897 from Lake, Mississippi where he had practiced medicine. He was born at Conehatta in Newton County in 1870, the son of Doctor and Senator J.B. Bailey (1843-1918) of Newton. Oscar Bailey received his medical degree in St. Louis and did postgraduate work in New York. During his residence at Ocean Springs, Dr. Bailey had been president of the Ocean Springs Bank since its founding in 1905. He and daughter, Beryl Bailey, operated a drugstore on Washington Avenue for many years. Bailey was married to Birdie Anderson (1876- 1925) of Edwards, Mississippi. They reared four children at Ocean Springs: Mrs. Beryl Parker Wood (1896-1986), Bemis Bailey (1898-1969), Mrs. Clothilde Campbell (1901-1995) of Lookout Mountain, Tennessee, and Mrs. Salome Watkins (b. 1903) of Handsboro. In February 1926, Dr. Bailey married Maude Holloway (1901-1980) of North Biloxi. During his tenure as owner of the hotel, Dr. Bailey leased it to Miss Mary Shanahan in December 1905. She called her establishment the Iberville Hotel. It was believed that Miss Shanahan's popularity would win for her a large patronage, but this was not the case. Shanhan closed the Iberville Hotel in March 1906 in order that she could concentrate on making the Shanahan House (the family hostelry), a first class establishment. Dr. Bailey sold his inn to Fred Cristina of New Orleans in August 1909 for $3500. (JXCO, Ms. Land Deed Bk. 35, p. 23) It was known as the Commercial Hotel at this time. In March 1910, an Alabamian, John A. McDonnell (b. 1871), rented the hotel, and opened a rooming house. His plans were to open as a regular hotel at a later date. In 1910, among those residing at the inn were City Marshall, Henry Taylor (b. 1876), and criminal attorney, Charles Loud (b. 1854). Fred Cristina conveyed the Commercial Hotel to H.F. Russell for $4000 in September 1913. (JXCO, Ms. Land Deed Bk. 39, p. 487) H.F. Russell (1858-1940) was born at Yazoo City, Mississippi and came to Ocean Springs about 1880 as a protege of R.A. VanCleave. Russell was an aggressive entrepreneur involved in furniture retailing, insurance, real estate, pecan propagation, banking, and newspapers. He served Ocean Springs as its Postmaster from 1885-1889, Alderman of Ward One from 1895 to 1902, and organized the Ocean Springs State Bank with Dr. O.L. Bailey in 1905. Entirely remodeled. Hot and cold water. Special attention to sanitation. Headquarters of commercial travelers. Rates $1.50 to $2.00 a day. Special rates by week or month. Opposite the depot. (February 11, 1915, p. 4). By 1919, Woodham and Newman were gone and Russell had leased the old hotel to Mrs. T.A. Bennison. Mrs. J.F. Ross (b. 1880), an Illinois native, opened a lunch stand the same year. Her husband, J.F. Ross (b. 1880), a Missourian is a hotel keeper in the 1920 US Census, and probably managed the Commercial with his wife, Maude Ross. By 1920, Mrs. Lambert ran the restaurant. J.A. Weider had supervised needed repairs in March 1919. Early in the morning of October 26, 1920, a fire was discovered in the Commercial Hotel. Immediately fire alarms consisting of fire bells, pistols, and engine whistles were sounded. Unfortunately the entire structure was consumed by fire in only a few minutes. Guest on the second floor made a hasty departure into the cool autumn darkness. Although winds were light, firemen had difficulty securing a convenient water supply, and the building was quickly lost to the conflagration. The Farmers and Merchants Bank Building west of the hotel had window damage from the intense heat originating from the hotel fire. Although the structure was fully covered by fire insurance, H.F. Russell stated that he would not rebuild the canvansary. Commencing with the Ocean Springs Hotel in 1905, and the Shanahan House in 1919, the Commercial Hotel became the third Ocean Springs hotel to be lost to fire in these early years of the Twentieth Century. H.F. Russell sold the empty lot to Ben O'Keefe and J.H. O'Keefe on May 18, 1921 for $1500. (JXC, Ms. Land Deed Bk. 50, p. 400) Their father, Jerry O'Keefe, had purchased the White House property to the east in 1906. This gave the O'Keefes approximately three hundred front feet on Robinson Avenue across from the L&N Depot. J.K. Lemon remembers as a boy circa 1925 that Ben O'Keefe had a livery stable, automobile service station, and a taxi service on Robinson Avenue. The former hotel lot was utilized as a parking area. Ray L. Bellande, "The VanCleave Cottage", (unpublished essay), 1992. Charles L. Dyer, Along the Gulf, "Ocean Springs", (L&N Railroad: 1895). Regina Hines, Ocean Springs 1892 (2nd Edition), (Lewis Printing Services: Pascagoula - 1991), p. 109. The History of Jackson County, Mississippi, "George Edward Arndt", (Jackson County Genealogical Society: Pascagoula-1989), p. 111. The Biloxi Herald, “Around Ocean Springs”, April 18, 1891. The Biloxi Herald, “Neighborhood Notes-Ocean Springs”, January 30, 1892. The Daily Herald, "Dr. O.L. Bailey Died Last Night", June 22, 1938, p. 1, c. 3. The Gulf Coast Times, "Construction of New Post Office at Ocean Springs Gets Underway", December 4, 1953, p. 1. The Jackson County Times, "On the death of Dr. J.B. Bailey", September 7, 1918, p. 5, c. 4. The Jackson County Times, “Local News”, March 29, 1919. The Jackson County Times, “Local News”, August 30, 1919. The Jackson County Times, "Fire Destroys Commercial Hotel", October 30, 1920. The Jackson County Times, “Local and Personal”, March 9, 1924. The Jackson County Times, Birdie Anderson Bailey Obit, November 21, 1925. The Ocean Springs News, “Local News”, March 12, 1910. The Ocean Springs News, “Local News”, February 14, 1914. The Ocean Springs News, "Says Ocean Springs is a Live Town", February 11, 1915, p. 5, c. 5. The Pascagoula Democrat-Star, “Ocean Springs Items”, April 30. 1880. The Pascagoula Democrat-Star, “Ocean Springs Locals”, September 8, 1882. The Pascagoula Democrat-Star, “Ocean Springs Locals”, September 15, 1882. The Pascagoula Democrat-Star, “Ocean Springs Locals”, October 20, 1893. The Pascagoula Democrat-Star, “Ocean Springs Locals”, January 26, 1894. The Pascagoula Democrat-Star, “Ocean Springs Locals”, March 30, 1894. The Pascagoula Democrat-Star, “Ocean Springs Locals”, June 19, 1896. The Pascagoula Democrat-Star, “Ocean Springs Locals”, March 5, 1897. The Pascagoula Democrat-Star, “Ocean Springs Locals”, November 12, 1897. The Pascagoula Democrat-Star, “Ocean Springs Locals”, November 19, 1897. The Pascagoula Democrat-Star, “Ocean Springs Locals”, November 10, 1899. The Pascagoula Democrat-Star, “Ocean Springs Locals”, January 31, 1902. The Pascagoula Democrat-Star, “Ocean Springs Locals”, December 15, 1905. 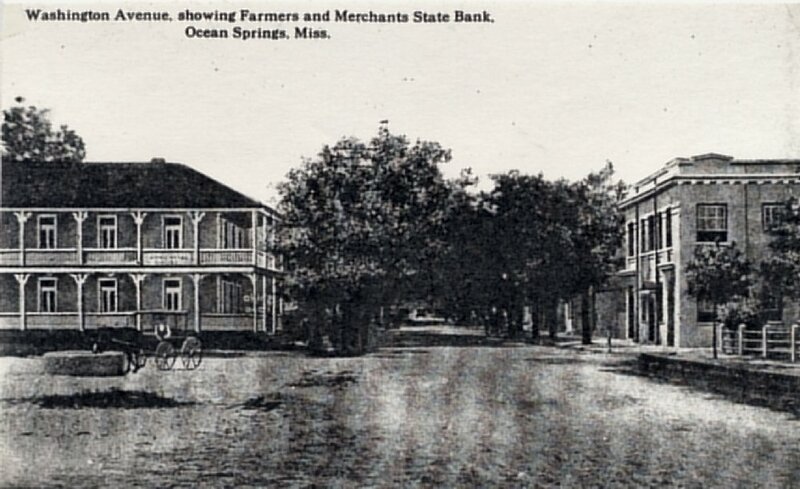 Sanborn Map Company (New York), "Ocean Springs, Mississippi", (1904)-Sheet 1.